UPDATE: I’m updating this to include a link to Rep. Matt Rinaldi’s letter to Bishop Burns. I think it is well worth reading. 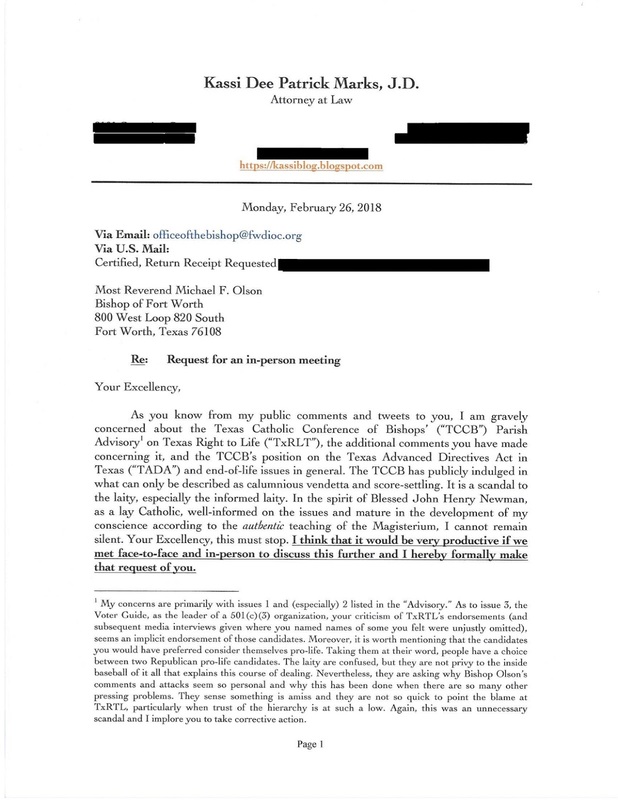 You may have heard that the Texas Catholic Conference of Bishops issued a “Parish Advisory on Texas Right to Life” last week basically banning them from any parish property and telling everyone that TxRTL lies, misrepresents the faith, etc. As set forth by Bishop Olson of Fort Worth – who seems to be the primary promoter of this, “The advisory regards the hostile position of Texas Right to Life towards the authentic Catholic teaching on the dignity of human life…” None of this is true and no specific examples are given. Indeed, when I mentioned this to Bishop Olson in a tweet, I received no response. 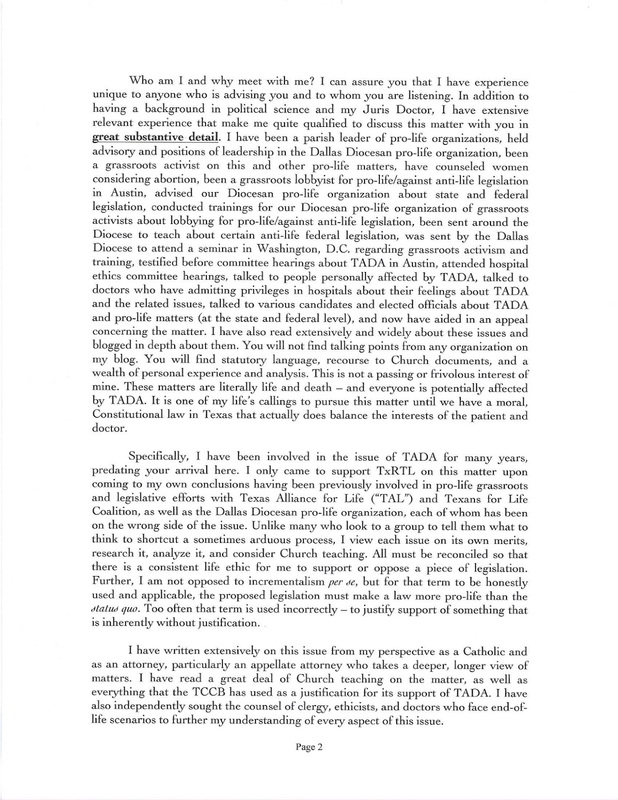 Readers of this blog know that I have taken issue with the TCCB’s position on the Texas Advanced Directives Act (“TADA”) and end-of-life issues as they seem to have consistently worked against any true reform efforts made to give even some semblance of due process to a patient. (If you are unfamiliar with TADA, search this blog, it has been pretty much entirely dedicated to that issue.) You know that I find nothing in Church teaching to support it morally. You know that I find nothing in the Constitution to support a total denial of due process rights to an ill patient. You know that I in no way support euthanasia, much less passive euthanasia, much less involuntary passive euthanasia which is exactly what TADA is. Thus, those that would work against any reform of this draconian law can only logically be said to support involuntary passive euthanasia. On the other hand, contrary to what I have written, try to find something where TxRTL has accused the TCCB of not holding fast to Catholic doctrine. Try to find TxRTL insulting the Bishops and calling them bad Catholics as Bishop Olson has done to them. Try to find something where TxRTL is claiming authority to teach Catholic doctrine. Try to find something where TxRTL is discussing Church doctrine. You won’t find anything. Because that is not their mission. They are not a Catholic organization, but a pro-life organization made up of individuals of various faiths. Their collective mission is promoting the value and sanctity of all life from womb to natural death – in utero, in the hospital, in all conditions from all threats that the culture of death brings. The allegations in this Advisory ring hollow because they are. In its response, Texas Right to Life did not respond in kind and did not get personal. The TCCB has come after TxRTL before, but never in so calumnious a manner. I suspect this is the result of the “Francis effect” and the “Trump effect.” Decorum is out the window. Everything is a bar fight and you should expect that from those who see themselves as your opponents no matter what office they hold. It is a scandal. The Church is in crisis and that is no secret to anyone, Catholic or not. I thought long and hard about this situation. As a faithful Catholic, it both grieves and enrages me. We don’t have enough to be concerned about and focused on? Really? But what is a lay person to do? The hierarchy are often misguided and believe themselves immune to correction – filial or by the laity. It seems a hopeless business. But in recent days I have been reminded of Blessed John Henry Newman who taught that a well-informed laity was necessary to the Church and, indeed, did much to save the Church from the effects of the Arian Heresy when the majority of bishops adopted that heresy. I have written of this before and analogized that heresy with the state of the TCCB on TADA. After thinking long and hard about this – praying – I felt a calling (a conviction as some of my dear, dear faithful Protestant friends might call it) to write the following letter which I have mailed and emailed to Bishop Olson after requesting four separate times on Twitter to meet to discuss these matters with him. (There was a time people met to discuss their differences calmly and professionally and in-person.) He “subtweeted” me and commented on the negativity of the tweets concerning the Parish Advisory. That avoids substance. If you have noticed anything about this blog, you should know that I am all about substance. I don’t care much for talking points and who’s allied with whom. I care about people, the pro-life cause, and the pro-life mission. I have worked with all the major groups in the state in my nearly 20 years in the movement. I have seen things that I will not share but have taught me a great deal. Politics is a messy business and not everything is as it seems and that is just as true for the organizations as it is for politicians. Thus, I have responded in what I hope is a respectful, meaningful, and substantive way. 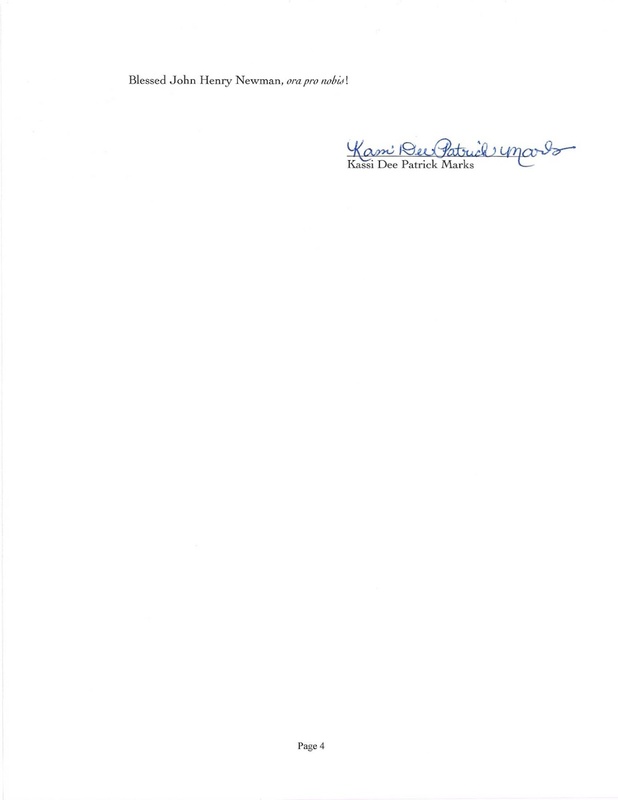 This letter is my fifth attempt to obtain a meeting with Bishop Olson. I explain why I think that is necessary and why I believe I am a person that can discuss these matters with him. I have no illusions (delusions?) that he will meet with me or anyone else even as I hope and pray he does. Nevertheless, believing that all things are possible with God, I ask each of you to prayerfully consider respectfully emailing, tweeting, calling, and writing him to ask him to meet with me about this. He needs to hear from someone other than those advising him and the TCCB to engage in scandal upon scandal as it relates to this ill-conceived Advisory and all the inside baseball internecine political warfare that this telegraphs to everyone. (And people are picking up on it because I’m being asked about just this aspect of it.) If he chooses not to meet with anyone on the matter and if the TCCB persists in this action without explanation and details to back up the flame-throwing, that in and of itself will tell you what you need to know. As a final note, I will be sending a copy of this to my own Bishop Burns here in the Dallas Diocese, who put this on their website. The annual Bishop’s appeal came this weekend right after this bomb was thrown by the TCCB. The Dallas Diocese will receive no money from my family. None. I will not support any organization that engages in these tactics and opposes meaningful, substantive reform to TADA. I encourage you all to consider doing the same and telling your bishops why. Sometimes we suffer in the short term so that we might benefit in the long term. It is time that we sacrifice in many ways so that we might begin to take back our Church. The laity has a voice, we need to use it. This is just one of many things going on that needs our attention, but it is local and it is significant because of all that it demonstrates about our leadership. Please pray for all involved. 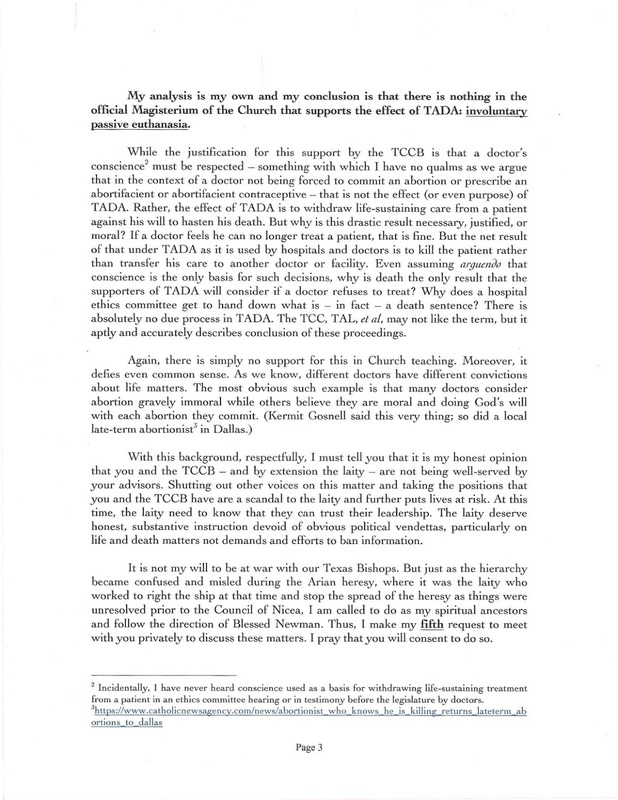 This is a mess – an embarrassing, scandalous, unnecessary mess created by the TCCB and ramped up to a feverish pitch by Bishop Olson. And…I think I’ll just leave it at that. Yes, of course I will pray. I will pray for Elizabeth and the TxRTL, for you, for Bishop Gracida, and for all those voiceless little ones who so desperately need you to not give up, even when such a hurtful betrayal has occurred. Yes we need to use our voices!!! Tel them they are wrong.